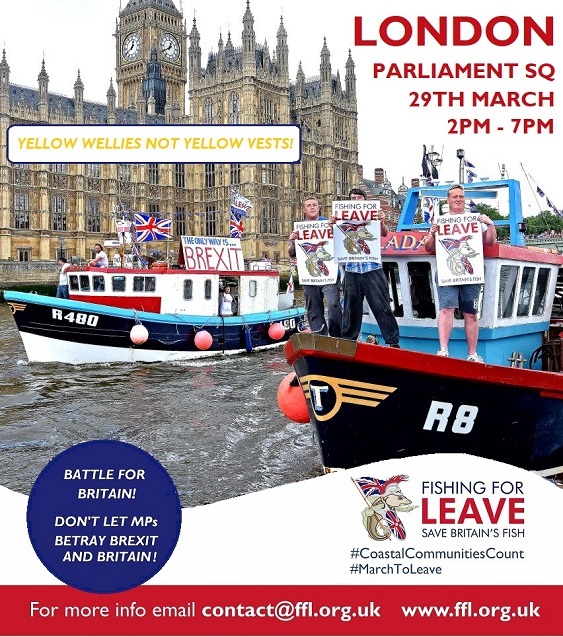 Fishing for Leave will stage yet another audacious event to highlight “the death sentence’ Theresa May’s Withdrawal Agreement or MPs thwarting Brexit presents to British fishing and coastal communities. Fishing for Leave are throwing their weight behind Brexit groups – and increasing public calls – for the government to scrap the loathed Withdrawal Agreement & for MPs to honour the Brexit vote by ensuring Britain leaves the EU with No Deal. The protests purpose is to remind our MPs who we elect that they must honour Brexit and that people won’t tolerate their disgraceful anti-democratic behavior. It is also to highlight our industry’s plight as symbolic of EU mis-rule to a public who are equally sickened by the governments actions. This is our last chance to bludgeon MPs to stop this surrender of Britain, Brexit and one of our country’s greatest renewable resource. One which can support a world leading £6-8bn industry that will support generations to come in coastal communities. It is now Clear europhile MPs are unashamedly trying to kill Brexit. Clear they care not a jot for the survival of our fishing & coastal communities that can’t survive much longer under CFP rule. Clear they hold our country & constitution of government by consent in complete contempt. They are fatally butchering our democracy.Mays deal’s a complete treasonous sell out of our fishing, our defense, our sovereignty! Once we are locked in THERE IS NO WAY OUT an internationally binding treaty.It CANNOT be ‘reformed from within’. Those backing it are cowards complicit in the surrender of our great nation to be an EU slave state. It’s terms are equally bad to those imposed on a people defeated in war. And we ask our thousands of followers, are you the British people defeated? Join us in Parliament Square to show our treasonous politicians you are not and that Brexit will never die! Join us on #MarchToLeave on Parliament Tomorrow. The Withdrawal Agreement represents a death sentence for the industry, as the EU will be free to enforce and impose detrimental rules on us to cull what’s left of the UK fleet. The Withdrawal Agreement will become an internationally binding treaty from which we can never escape as outlined by the governments Attorney General. Under the terms of the Withdrawal Agreement the government has agreed to re-obey all EU law post-Brexit for a 2-4 year Transition. This means our already struggling industry will remain trapped in the disastrous CFP until possibly January 2023. This would allow the EU to enforce any detrimental laws to cull what is left of Britain’s fishing industry. The EU would be free to slash quotas Britain is dependent upon; abolish the twelve-mile limit; and trade UK resources in international deals. Of particular horror is it would mean the EU can demand full enforcement of the EU discard ban which fishermen say is ill-founded. Under Discard ban rules a vessel must cease fishing and tie up for the majority of the year upon exhausting its lowest quota allocation even if it has significant quota allocation for other species to use. Government agency Seafish estimates 60% of UK resources will go uncaught and a similar portion of the fleet will go bankrupt as a result. The EU has every incentive to enforce any and all detrimental legislation to cull what’s left of the UK fleet. Under international law if we no longer have the fleet capacity to catch our own resources then the EU can then claim these resources using international law under Article 62.2 of UNCLOS. Even worse – under the Withdrawal Agreement the UK has agreed to ratify the draft Future Relationship for after the 2-4 year Transition. A Future Relationship to be based on “existing reciprocal access and quota shares”; based on ‘non-discrimination’ (the founding principle of equal access to a common resource) and any fisheries agreement would be traded “within the context of the overall economic partnership”. It is a total turkey trap, where the EU can force Britain into CFP associate membership forever. It is not much better for any other part of our nation. The Withdrawal Agreement puts Britain over the barrel, paying £39bn or the privilege, and then only to be forced into becoming a permeant vassal state under the draft Future Relationship. MPs must respect the democratic instruction and leave the EU on the 29th of March with No Deal which is No Problem! To all patriotic Britons – this is the time to kick and scream. Let it ring in MPs ears that Britons won’t take a betrayal of Britain or Brexit. Join the March to Leave!